DVIGear will exhibit the latest SDVoE technology in its DisplayNet AV-over-10GbE distribution platform at ISE 2018 in Amsterdam on February 6-9 in stand 1-N30. 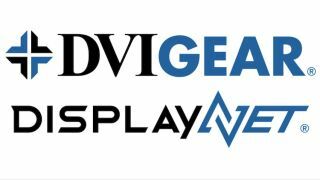 DVIGear is also demonstrating its suite of end-to-end 4K UHD video distribution solutions at the show, including its new HyperLight DisplayPort v1.4 Active Optical Cables and the DVI-7340 / DVI-7341 MultiPort 4K Fiber Optic Extenders. The DN-200 Series is an extension of the DisplayNet AV-over-IP product line. Each transmitter accepts multiple source signals including HDMI (with embedded audio and HDCP), DisplayPort, analog stereo audio, bidirectional IR, RS-232, and 1GbE Ethernet. These input signals are packetized into a 10GbE stream and are distributed to destinations via an off-the-shelf 10GbE network switch. The DN-200 Series supports twisted pair (Cat-6a or Cat-7) media up to 328 feet, or fiber optic media using an industry standard SFP+ module supporting extension distances up to 18 miles. The 10GbE switch provides an efficient and reliable means of distributing AV signals from many sources to an array of receiver units, which convert the packetized data to AV output signals at the destination in real time without introducing frame latency or any loss of image quality, according to the company. The DN-200 Series leverages the latest SDVoE technology to distribute uncompressed AV signals with resolutions up to 4K60 over a 10GbE Ethernet network. The DN-200 Series adds support for HDMI 2.0 with up to 12-bit color, HDCP 2.2, DisplayPort 1.2, and High Speed USB 2.0. A high-performance scaler in both the transmitter (Tx) and receiver (Rx) units enables very fast switching, multiviewer, and enhanced video wall processing. DN-200 transmitter and receiver units are available starting at $1,350 MSRP per endpoint. DVIGear will also exhibit its latest DNS-200 DisplayNet Server at the show. DisplayNet Server provides a central interface between the control equipment/software and the DisplayNet endpoint devices; therefore, it is an integral component of every DisplayNet system. This server supports web browser-based DisplayNet Manager software that provides a host of powerful control features, as well as tools to facilitate the use of third-party controllers that enable DisplayNet to be integrated into a wide range of professional AV applications. DVIGear’s HyperLight Series is a new generation of advanced active optical cables (AOC) that supports DisplayPort 1.4 and provides a wide range of features in a compact, lightweight form factor. They are fully HDCP 1.4/2.2 compliant and support signals with data rates up to 32.4Gbps, according to the company. These features enable HyperLight cables to support very high-resolution applications at 4K at 60Hz (4:4:4) with cable lengths up to 100 meters and 8K at 30Hz (4:4:4) up to 50 meters. HyperLight cables are plenum-rated (UL CMP-OF) and highly flexible. Constructed using a hybrid design of Polyfluorinated Optical Fiber and copper wires, they are rugged yet flexible, with a two-millimeter minimum bend radius. To further minimize cable diameter, DisplayPort docking connectors may be detached making the cables easier to install in narrow conduits and plenum spaces. Video signals are transmitted over the optical fibers, making them immune to interference from environmental noise. The optical transmission path provides a very low RFI/EMI profile that allows the cables to be installed in sensitive applications with strict security requirements. By drawing power from the connected DisplayPort source, the need for an external power supply is fully eliminated. Ready for shipment, HyperLight AOC cables are suited for applications that require ultra high-resolution DisplayPort signals to be extended over long runs while preserving image quality. The DVI-7340 and DVI-7341 are high-performance 4K Optical Extenders designed to achieve much greater distances than other extension methods such as copper cables or Cat-x extenders. Each extender set consists of an optical transmitter module that converts the AV signals into light pulses for transmission over a single strand of multi-mode or single-mode optical fiber cable. An optical receiver module converts the light pulses back to AV signals for the display as well as other downstream devices. The units handle cable distances of up to 1,000 feet with or without HDCP. In applications where HDCP compliance is not required, optical links up to 1.2 miles are supported. The extenders manage multiple signals such as uncompressed HDMI or DVI, embedded audio, balanced or unbalanced external audio, bidirectional IR, RS‑232, and Ethernet using a single fiber optic cable. Managing HDMI with embedded audio as well as independently routed balanced audio signal extension, they support ultra-high resolutions up to 4K UHD, and offer three EDID modes. The DVI-7340 and DVI-7341 are shipping now at $1,350 list price per set.